A yummy addition to our summer meal menu options! We are on our second heat wave this month. When you’re in the midst of a heat wave like this, sometimes you don’t feel like cooking. Or eating. Scratch that. I almost always feel like eating, even when it’s hot. But what to eat becomes the question. You don’t want to turn on the oven and sometimes it’s even too hot to grill outside, because when it’s 100 degrees, do you really want to stand over a hot fire? Sunday was that kind of a night. What to eat? What to cook. Don listed everything in our fridge and freezer but nothing sounded appealing. He’s never that thrilled when I say no to everything we have. On this night however, it was a good thing that I didn’t want anything we had on hand. We ended up trying a great new recipe from the Sugar Free Mom blog and loving it! I know I’ve mentioned Brenda’s blog before, but if you haven’t visited it yet, now’s a great time to do so. 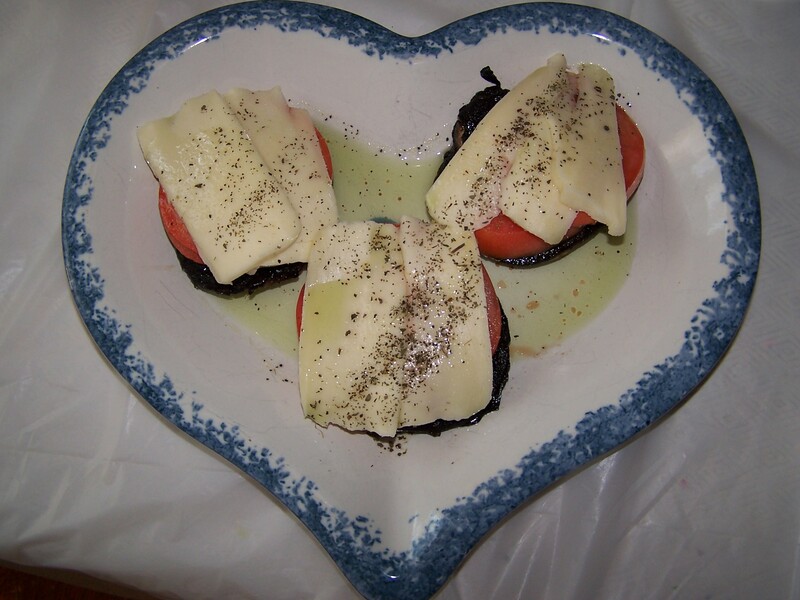 The recipe we tried was for grilled Portobello mushrooms made Caprese style; a great summer menu addition. Another friend of mine posted the recipe on Facebook and I knew immediately that this meal was in our future. We bought three Portobello mushrooms, (we knew not everyone would like these so we only bought for those who would), some mozzarella cheese to slice and some good-sized tomatoes to slice up as well. Rather than grilling the mushrooms, Don cooked them in our cast iron skillet, and they were fabulous! 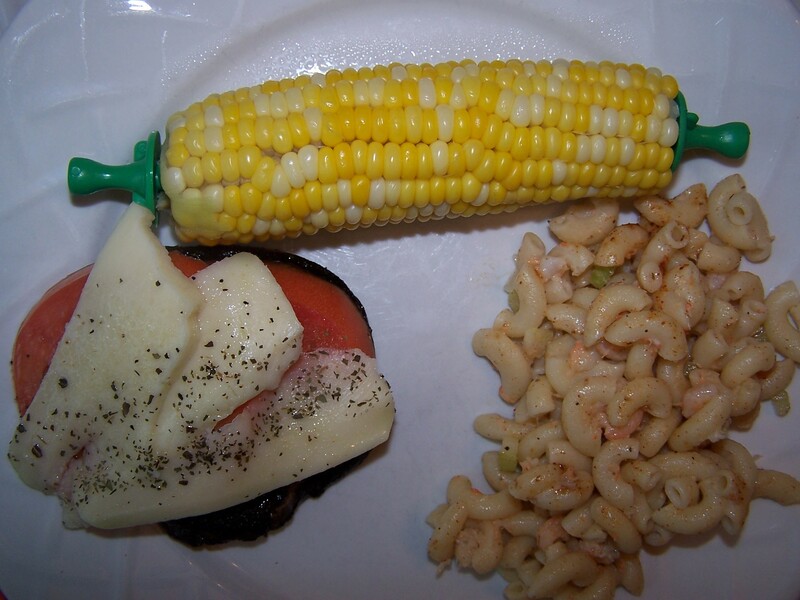 We served ours with a side of macaroni salad and corn on the cob. A perfect summer meal. Give Brenda’s blog a visit, and try out her recipe! I know you’ll love it, and you’ll love her photos. Her Portobellos were much prettier and more photogenic than mine! We did not have fresh basil on hand so we used dried instead. Wash the mushrooms and drain them on paper towels upside down then pat dry. Turn them upright. Spray the mushrooms with nonstick cooking spray. Sprinkle 1/2 teaspoon salt and garlic powder over the mushroom caps. Add a few cracks of pepper then place the seasoned side onto a medium high grill or grill pan. Follow the same procedure for the bottoms of the mushrooms and allow to cook for 2-3 minutes on one side before flipping over. Top each mushroom cap with one slice of tomato and cheese. Close the grill for 1 minute to let cheese melt slightly. Place caps onto a serving plate. Add one large basil leaf to each cap. Drizzle extra virgin olive oil over the tops, season to taste with more salt and pepper if desired and serve warm or room temperature.